Voice Search: It’s Here. Is Your Content Ready? If only you could ask Google or Alexa how to get ahead in voice search. The statistics about voice search are everywhere. In 2017, nearly 24.5 million voice search devices, like Amazon’s famous “Alexa” and Google’s Google Home voice assistant, were shipped across the United States according to Search Engine Watch and research by Croud. In addition to the physical voice assistants on your end table, smartphones come equipped with their own vocal options, such as Apple’s “Siri”. In a 2016 voice assist report by MindMeld, nearly 60 percent of voice searchers relied on voice search for its convenient hands-free option that makes it ideal for when a user’s vision and hands are preoccupied, like while driving. Now, in 2018, voice search is continually on the rise. While Amazon has seen an uptick in users relying on voice search to purchase products from their website, a study earlier this year indicated that most consumers are still using voice search as a research engine. As more consumers begin to invite these robotic family members into their home, marketers around the globe must consider how this impacts the conversion of bringing users their websites and delivering what they’re seeking. 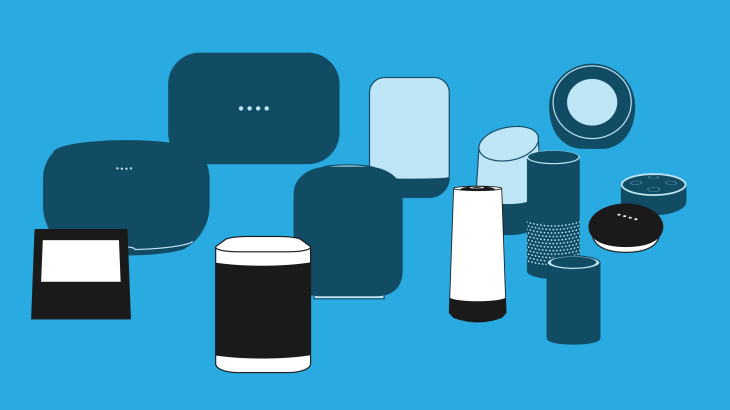 As of this publication, there are several options for voice assistants on the market today. Some you may have in your home, and others in your pocket. Across the board, however, their popularity and use is increasing as we continue multitasking and relying on voice search to be our robotic secretaries. Before we start theorizing the return of keyword stuffing or other long-gone SEO tactics, it’s important to know what sources these new voice assistants are using to return results. While keyword stuffing is still a thing of the past (seriously, don’t do this), keyword research still has a place in the voice search world, according to Muller. 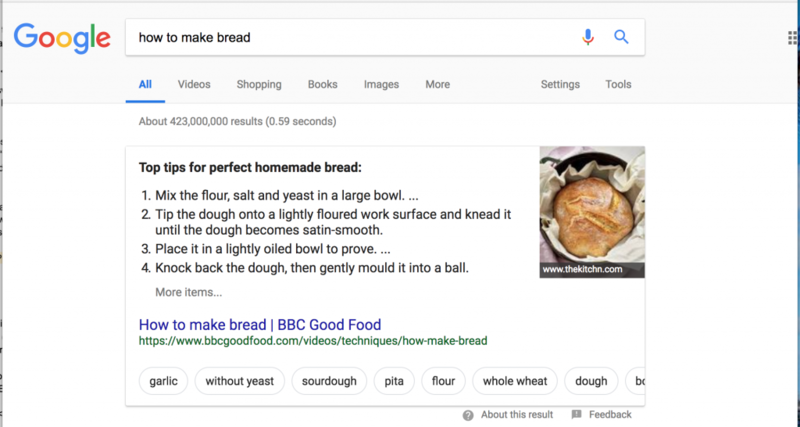 Because Google provides its users answers in forms of the featured “snippets,” it behooves marketers to invest in keyword research to learn more about how to compete for that real estate in search results. However, it’s important to remember that entity authority also has some weight in the voice search results field, and the more well-known and successful your domain is, the better chance you’ll have at real competition opportunities in snippets and voice results. As Google, Bing, and other search engines continue to evolve their respective algorithms to better respond to more human-like content (and not keyword stuffing), writing unique, benefit-rich, user-focused content is more important than ever before. This is especially vital in the world of voice search because voice searches tend to be longer phrases than the typical keyboard search. But even if the queries are longer, the results returning to users are still conversational — meaning they’re fairly short and sweet, answering the heart of what the user is searching for. Conversational keywords and phrases should mimic how users talk, content silos should anticipate how users research. Consider your approach to subheadings on your content — are there questions that users frequently pose to find answers related to your industry, and are those questions woven into your content? 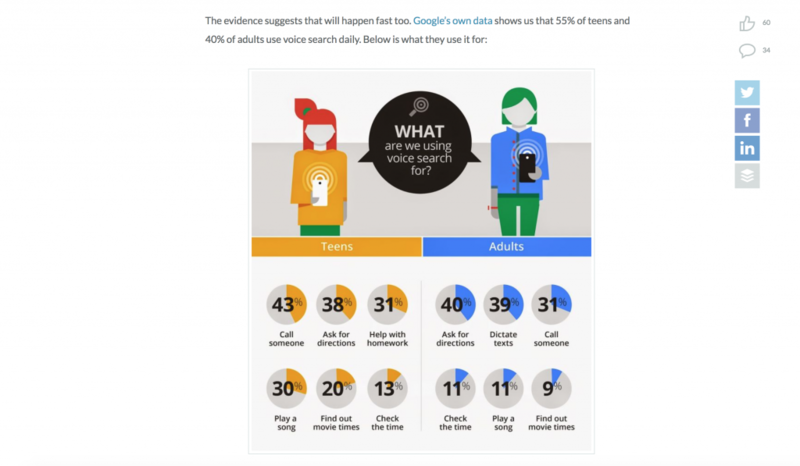 According to a Moz study of more than 1,000 voice searches, questions with “how” and “how-to,” as well as “what, when, and where” top the queries on voice assistants. And, the majority of results are text- or list-based. With this, some experts, like Sherri Bonelli at Search Engine Land, recommend building FAQ pages. Before you do, consider how to build healthy, user-friendly FAQ pages that deliver what your visitors need. According to a 2016 Internet Trends Report, 22 percent of searches are for local information, but that’s just one piece of the pie. 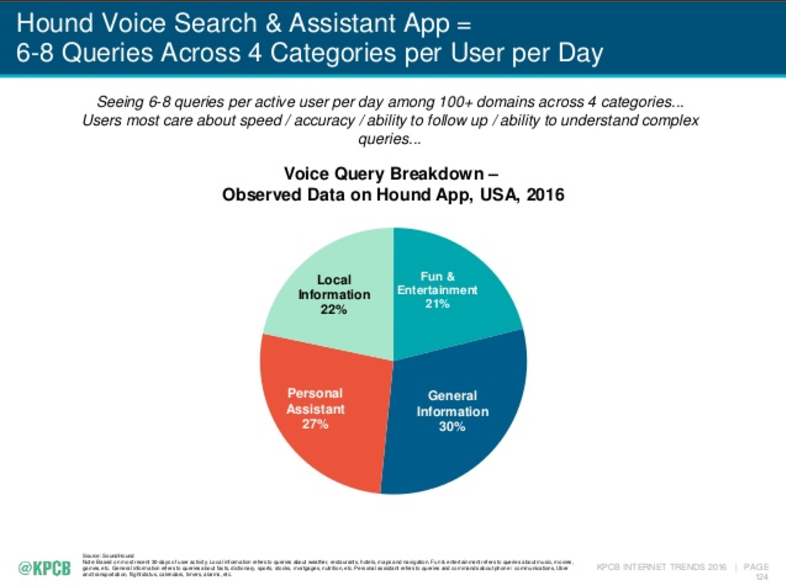 General information, entertainment, and personal assistant usage (such as calendar scheduling) are also some of the more common search queries for voice search. Because local listings are such an important cornerstone to voice search experience, it’s wise to claim your Google My Business or Bing for Business listings as soon as you can, and keep your content updated. Reviewing and responding to local reviews, too, can be essential to the value of your business listing. And it’ll likely be what local searchers are trying to pull up when inquiring about local businesses, services, and products. Aside from local listings, it’s helpful to employ structured markup, such as Schema.org practices, to your site. Schema tells search engines what your site is about, not just what’s on it. And this kind of information – including the different content types you have (from profiles to blogs), as well as the primary language of the content, can be essential to voice assistants returning the right results. No matter who your target audience might be, thinking about the stages of their buying or searching process can help you better plan the architecture of your site and its content. In the age of Artificial Intelligence – or AI – which relies heavily on a user or customer journey to appropriately route the next response or action, voice search results can do the same. In Moz’s Voice Playbook, a conversation map — even if it not available in reality — can help your company map possible outcomes for voice search. “…You’ll see that there are huge swathes of the conversation that lend themselves to opportunity, either through content creation or some other kind of optimization,” writes Simon Penson, who uses a lawnmower conversation in his Moz article to demonstrate the types of content that could return on a voice search. And as we’ve advised before, building empathy maps can result in similar goals. Not only can you build a more precise persona for your target audience — allowing you to understand their pains, gains, goals, and concerns — but you can find gaps in content, navigation, design, and other experiences that may be lacking. Kill two birds with one stone: Prep yourself for voice search results, and make your website experience even better. Subheadings and bulleted lists to divide up content, making it easier to scan the page. Shorter sentences and paragraphs written in a user-first way (for example, speak to “you” rather than “customers” to engage the reader on the other side of the screen). Content written with language your user understands (see: journey mapping). Avoid jargon and business-heavy language, even if stakeholders ask for it. Optimized images with alternative text to illustrate the point of the content, especially graphs and charts with appropriate captions. Properly formatted page titles and meta descriptions that describe the content of the page accurately and uniquely, making each page of your site a crawlable asset to search engine results. Crosslinking content to related content on your site, or reputable third party sites, to better explain products, services, or information to your users. Unique calls-to-action on each page of your site, driving the reader to a conversion, whether it’s a newsletter sign-up, a demo or estimate, pricing options, or to contact your brand. Writing for an end-user will result in better user engagement and conversion opportunities, regardless of the search path a user relies on to reach your brand. When you’re trying to tap into voice, consider using these same best practices to invest in content marketing, which can help capture even more specific search topics and long-tail keyword phrases to connect with voice audiences.